Good news for our European readers, in case you were wondering when Namco would be bringing Tank! Tank! Tank! to Europe. Brent Sales has sent out a press release stating that they will be showing the game off at the London Preview next month and will be distributing the game to certain countries on the continent in 2010. They also have announced that they will be distributing other titles such as Chicago Coin’s PUTT: Championship Golf, and the ball tossing game Go Ball-istic, which will both be seen at their booth. The press release does mention that some Raw Thrills titles will also be seen at the booth but they did not mention what those will be (Terminator Salvation perhaps?). Hit the break for the full release. Brent Sales, the UK subsidiary of Namco Europe, is preparing for Season 2010 by adding a number of new amusement games to its portfolio. At least five brand new titles from world renowned manufacturers will be unveiled to the European industry for the first time at London’s Preview exhibition in October. The starring role will be played Bandai Namco Games’ new Tank! Tank! Tank! – a full simulation tank battle videogame with pneumatic moving seats. Up to eight units are linkable for head-to-head and team-based blasting. Amongst the list of debuts are two new releases from redemption specialist ICE, for which Brent/Namco holds exclusive distribution rights across key European markets including the UK, Italy and Ireland. Go Ball-istic, an interactive ball toss game featuring five fun family themes played out on a jumbo 47-inch touchscreen, and Photo Finish Racing, a three-player fusion of classic midway ball rolling with hi-res, big screen horseracing action, will feature alongside a further six ICE games on the Brent stand, including Big Win Super Spin, Buster Bubbles, Free Fallin’ (Standard and Max), Hat Trick and The Price is Right pusher. Adding to the company’s successful line of skill-based merchandisers – which includes Barber Cut and Clena-Flex, the latter benefiting from the release of eight new set-ups – a new prize vending sensation arrives in the form of ‘Marksman’. Game play comprises carefully aiming a plunger to penetrate a target of choice, with successful players claiming one of nine prize categories prominently displayed. Marksman can be configured to host a range of family prize products and has optimum performance at a stake-prize ratio of 1:50. Another new release, from the Chicago Gaming Company stable, PUTT! Championship Edition is a ticket redemption/amusement-only crazy golf game that uses a real putter and ball to make the seamless transition between real play and video-based simulation. Preview stand CH13 will feature more new launches alongside a host of high performance games from other world renowned games developers including Fantasy Entertainment, Jennison Entertainment Technologies, Play Mechanix and Raw Thrills. Sharing the same stand and providing a comprehensive spares and after-sales support package, Brent Electronic offers a range of extra income generating merchandise for a wide range of locations and player profiles, including the latest electronic gadgets, quality plush, high fashion toys and exclusive confectionery. 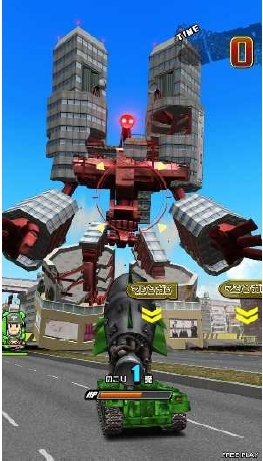 Bandai Namco Games’ kiddie rides division also presents its latest line-up of Amutec, Merkur Gaming brands of licensed and unlicensed kiddie rides, alongside juvenile amusement games. TAGS » arcade, Europe, Tank! Tank! Tank! We covered Block People in the IAAPA’08, ASI’09 and ATEI’09 coverage already? I know that but sega are considering releasing it world wide. besides thers been no mention as to if it comes out world wide or not but it says on one of the videos about a possible world wide release.